2018 was an intense year for the proxy world. The old proxy wolves tried to fight for their rights at the top, whilst new providers popped up and started building their services alongside the fight. Some oldtimers kept their place, continuing to lead others by example, but some young blood did emerge and overtook the ranks of bigger providers. We, of course, already ranked and named the best providers to date, however, it is most curious, what will 2019 bring. Will the leaders of the proxy pack keep their place? Or will the freshers become the new rulers of the proxy world? This article aims to answer these questions. Based on a lot of data and research, we dive into who could be the best proxy service of 2019 to dominate the market. In 2019 market research, we analyzed top performing providers based on their ability to stay stable while we increased the load of concurrent sessions. In the graph below, you can see that the top five providers are clear: Oxylabs, Geosurf, Smartproxy, Luminati, and Storm Proxies. Oxylabs and Luminati are the oldest providers in the market, however, it seems that once a big wolf, Luminati can no longer hold its first position as it once did, falling to the fourth place. Oxylabs overtook as number one, and relatively new Smartproxy came in the top three. It is clear who is the current best – but will they maintain their top places? Or will they fall, and new ones will rise? Having the overall best performance, Oxylabs would be hard to beat, however Geosurf and Smartproxy are so close and breathing down their necks, other statistics need to be pulled out to see who could win this game. Based on our market research, Oxylabs leads the way with the best success rate, and with their response time being less than 5s. Nevertheless, Geosurf and Smarptorxy are still too close to Oxylabs based on performance to say that they will keep their first place. However, if you take Oxylabs average response time and success rate and put them together – they win at being the most stable proxies out there. Along with being the most stable, Oxylabs proxies are the least blocked proxies on the market. It is a feature that is hard to come by, especially with all the turmoil with new stricter data gathering laws popping up. Having amazing overall performance, success rate and response time, Geosurf could become the best proxy provider. Not only that they have well-performing proxies, but they also work hard on their marketing. 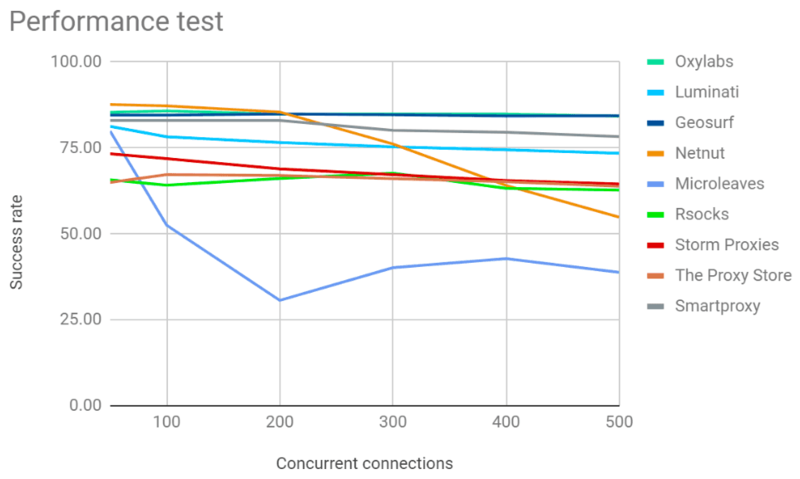 In our research, we discovered that the most searched proxy service provider on search engines was Geosurf, and they keep their marketing performance well-managed. Smartproxy emerged very recently, but it took over the proxy world by storm. Within a year, they managed to build such a reliable service one would be surprised they haven’t been around in the proxy world too long. Their overall performance metrics rank high, so does their success rate, going neck a neck with Oxylabs and Geosurf. One of their top qualities also their customer service – their team not only answers quickly, but are extremely helpful too! Luminati – the longest standing wolf. They’ve been around in the proxy world for quite a bit now, so they do have the knowledge to stay at the top. However, they’ve been slacking behind in the past last year if comparing to Oxylabs, Geosurf, and Smartproxy. Their performance metrics are still good of course, but not as good as they once were. Nevertheless, Luminati is still going strong with their marketing. They have the best overall marketing performance, have the most website visits (3.81M), are one of the most searched proxy service providers on search engines, and have the strongest brand name out there. Storm Proxies rank as number five at current top list, but that doesn’t mean that they couldn’t jump to the top. Why? Well, they have the best response times amongst all proxy providers. Proxy speed is very important, especially for those who use them for sneakers or social media. Storm Proxies also do really well for themselves when it comes to marketing. They have over 1.56M website visits, are one of the most searched proxy providers on search engines and also have a solid brand name. Having the best proxy speeds and a good name makes it hard to get into their way. It is fair to say that the top proxy services are at the top for a reason. All have their advantages, and some are better than others. 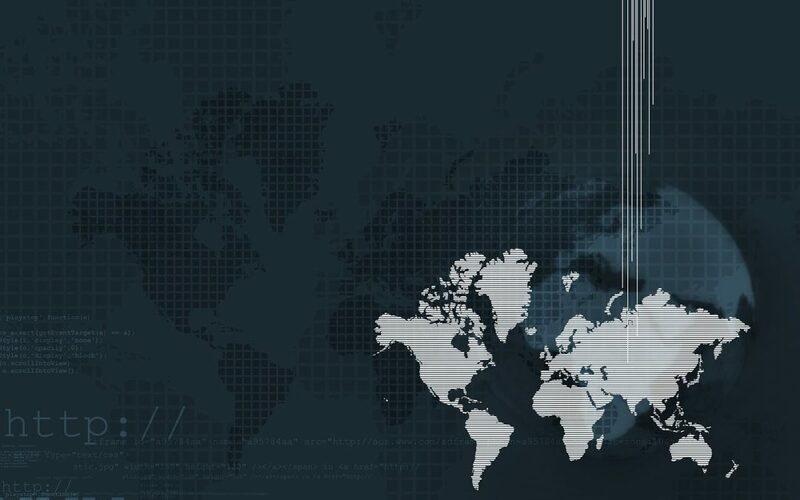 If we would guess who could reach the top based on the current trend – Smartproxy can be the provider to surprise us all. After all, within only a year they managed to reach the top field players. Of course, topping Oxylabs or Geosurf would be incredibly difficult – they have extremely well-performing proxies. The question is – which one will become the leader? Oxylabs has the advantage of having the least blocked proxies, and Geosurf does well in all fields – including marketing. Only time will tell, but the guess is that these five: Oxylabs, Geosurf, Smartproxy, Luminati, and Storm Proxies, will be in the top five – only their positions might change. 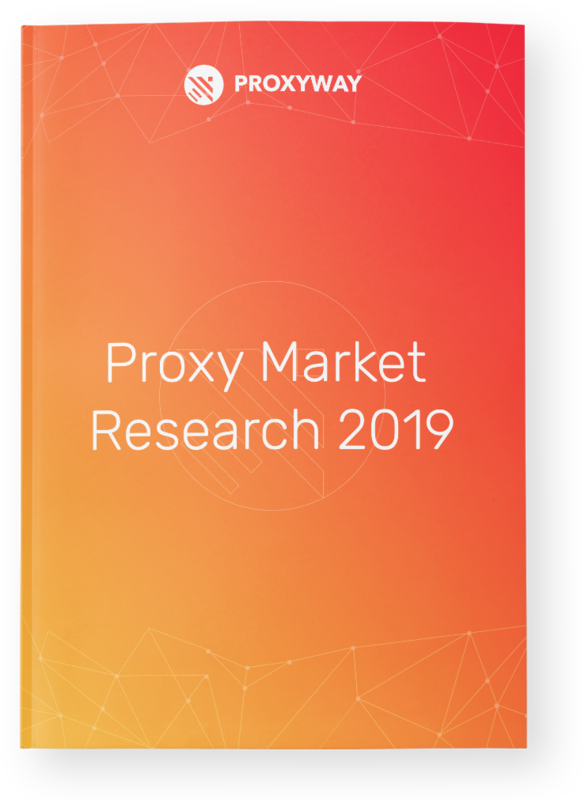 To get a full detailed view on what is and what’s to come in the proxy world read the 2019 Proxyway market research. Perhaps you’ll choose a personal best proxy service on your own.